For most of the people who are affected by the problem of being overweight or obese, there comes a moment when we decide to lose weight. Our next step is to look for a “diet”. We usually want to lose as much weight as possible in the shortest possible time. We research the latest trends in dietetics. We read colorful newspapers that shout to us from their first pages: “minus five kilos over the weekend!”. Regardless whether this diet has any medical foundation, not inquiring whether it provides the body with everything it needs, full of faith, hope and the desire to quickly achieve the goal, we start THE DIET. We agree to many sacrifices, we turn a blind eye to feeling unwell. We try to ignore the hunger accompanying the diet and convince ourselves that we do not feel like what our body demands. Time passes and with it come the first crises. At some point our plummeting weight stops dropping for a while. We find ourselves desperate, demotivated, not willing to look for an explanation of this situation. Instead we only blame ourselves for this state of affairs. We come to the conclusion that the chosen diet is not effective for us. And even if we manage to lose a few kilos, we often feel lost, not knowing what the process of coming out of the diet should look like. We set ourselves the goal: “I want to lose weight” without asking ourselves “how do I maintain this”? More time goes by and up to 80% of us experience the yo-yo effect. With a bitter taste of discouragement caused by our failure, in a while, we again try to reduce our weight. Some people repeat this scenario up to a dozen times during their lifetime. Hearing the word “diet” we feel hungry. We sense limitations. We are terrified by the need to count calories, weigh products and control how much of what, when and how we eat, drink, digest, etc. Often at the thought of our resolution “I start on Monday, Christmas, New Year or just after the holidays” we already regret that we have made such a decision. I imagine that by now you get a clear picture of what being on a „diet” feels like. I too, like a drowning man clutching at a straw, used to desperately try new, innovative diets. If you’re only interested in fast and significant weight reduction, unfortunately you will not find a quick-fix here. But if you’d like to cleanse your body, in order to speed up metabolism, which a side effect results in the reduction of kilogrammes, then the Transformation Programme will be a good solution for you. Thanks to the holistic approach, you do not focus only on your weight, but you also see many other advantages of the Transformation. Holistic slimming goes step further than the “diet”. Diets can be seen as a harmful way of eating, aimed at the fastest possible weight loss. Holistic slimming is a transition on the mental and physical levels. It is weight reduction combined with personal development. It’s slimming without major restrictions, without counting calories, without obsessive weighing, without remorse and without blaming oneself. The main character of my Programme is SOUP – a cooked, half-liquid dish. However, it is the main dish only in the second stage of the programme! The nutrients dissolved in it, are easily absorbed by our body. 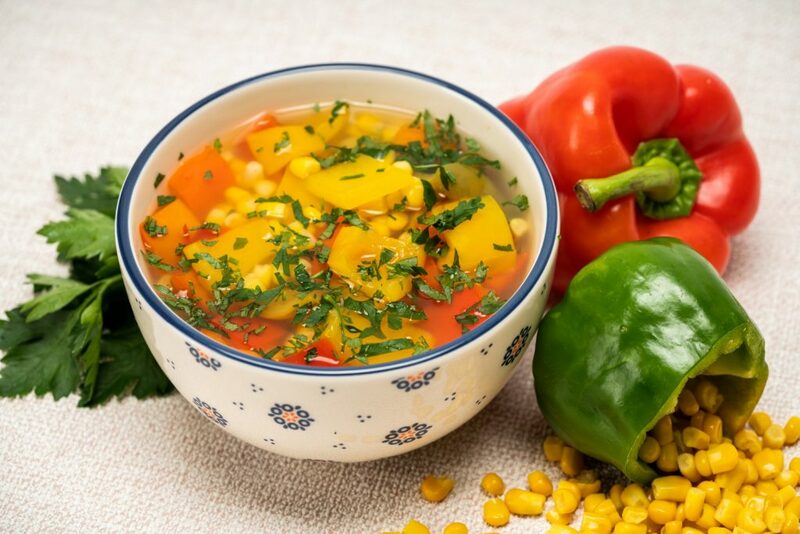 Soups are cleansing and very nourishing. They also play an important role in strengthening and hydrating the body. By doing this, they support metabolism, which in obese people is often slowed down. Thanks to introducing changes suggested in the programme, the water and mineral balance in the body stabilise and the acid-base balance improves. As a result, all this contributes to a significant improvement in metabolism. It can only mean one thing – the reduction of kilogrammes. I know you enjoy the idea of losing weight, but let me tell you something. It is impossible to achieve a permanent physical transformation without changes in your psyche. After many years of struggling with obesity, I’ve learnt a lot and I would like to share with you my methods for a holistic approach to weight loss. First of all, I want you to learn how to maintain a healthy distance from yourself and to have self-respect. You must stop blaming and accusing yourself, waiting for immediate results. You are here to help yourself, and not to hurt yourself any more. I will show you how to prepare to get started. Then I will teach you how to persevere and – what is equally important – what to do so that the hated yo-yo effect does not occur. What distinguishes my way of reducing weight against other diets is the fact that diets are usually very restrictive. Surprisingly, this programme assumes that we will eat and not starve ourselves. In addition, the food we will be eating, will be tasty, healthy and diversified. It will be so delicious that other household members will steal those dietetic delicacies from your pot – I promise! A number of advantages! No, I did not invent them myself. All these things have been observed by people participating in my „Transformations by Monica Honory®” programme. Are you interested in more than reducing as much weight as quickly as possible? Would you like to feel just fine and healthy? Would you like to regain your faith in yourself? Do you value the diversity and the possibility of selection of dishes? If you answered “yes” to just a few of these questions, then this programme is for you. The first step towards a new life. Let’s take the next one together. “Transformations by Monika Honory®” – this programme is NOT a diet, there is no beginning or end. The programme is set to really transform you – both mentally and physically. “Transformations by Monika Honory®” – this programme is based on respect for your body, your psyche and your – also previous – lifestyle. “Transformations by Monika Honory®” is a programme that makes you change your life for the better. All you have to do is be willing! Would you like to join the Transformation Programme, but you are not sure where to begin? You do not know how many meals to eat, or what products to reach for? I have great news for you! Below you will find the most important principles of the Programme, necessary to start the process of healthy weight loss. If you are at the beginning of our journey together, it is worth starting your actions with the right motivation. It may seem not very important, but without arranging everything in your head, setting yourself a goal and listing the reasons for which you are undertaking this challenge, the process of slimming will not have long-lasting effects. So, before you start, sit back and answer these questions: Why do you want to lose weight? What is your goal? For whom or for what do you want to do it? What is your motivator? Is it about your health? Maybe you take this challenge for your loved ones? Believe me, these are very important questions. Asking them helps in dealing with internal crises that may occur during the process of weight loss. Book: „The value of the psyche in slimming” is there to help you. Remember that the information presented here is only the basic knowledge of the Transformation Programme. I encourage anyone who would like to start a weight loss process with me, to book individual consultations, during which we will map a personal path to losing weight. During a telephone conversation or a direct meeting, I will be able to present the most optimal and tailored action plan. 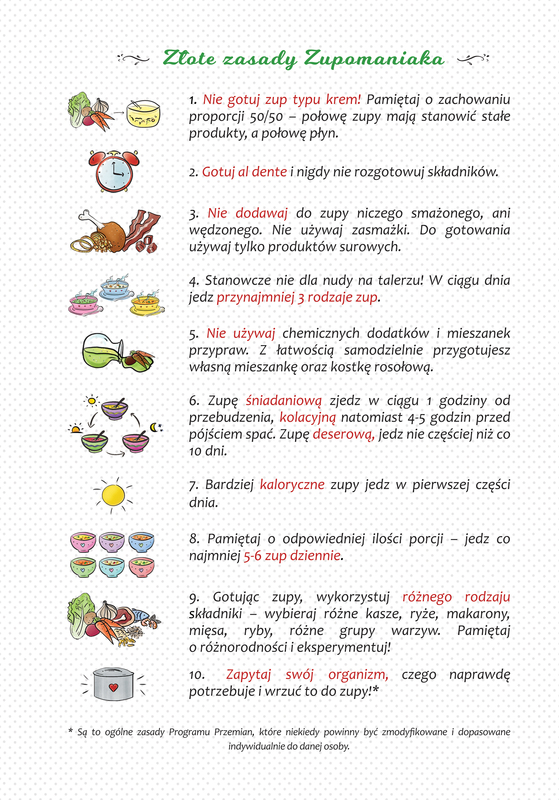 Culinary-guidebooks: “Soups filling but not fattening”, „Soupomania – healthy weight loss with Monika Honory”, “Successful slimming with soups by Monika Honory”, and ”Soups in a flash” are positions containing recipes for simple and tasty soups. Soups listed in them are good for any time of the day. Book “Preparing for weight loss” contains practical tips for dealing with the first weeks of transformation. It also advises how to prepare for the change in a physical and psychological way. On the basis of the latter, a more extensive position was created: „The value of the psyche in weight loss”. „Transformation Diary” is a supplement to all the other books from the Programme. It allows you to keep all the important information and your own notes from the weight loss process in one place. “Life without the yo-yo effect – the light cuisine of Monika Honory” is a help for everyone starting the Transformation Programme, as well as a dose of knowledge for each of the four stages. The Transformation Programme is not only about healthy soup-based nutrition, but above all, it is about working on the physical, mental and spiritual dimensions. To facilitate this process, a Casket of Inspiration and Motivation was created. It is meant to remind you about your goals, set positive attitude to life, to yourself and to others. It is also meant to encourage you to act and support you in difficult moments. Slimming, of course, is not only healthy nutrition and the right mental attitude. What compliments a healthy lifestyle is also physical activity, which I strongly encourage you to engage with. Relax, I will not ask you to spend hours in the gym, pouring with sweat. I think that here, you should also start slowly and gradually. Try starting with walking, every day a bit further. Use the stairs instead of the elevator. You will be surprised to will feel the difference just after two weeks you! I also encourage you to use my DVDs with exercises designed for people overweight and with obesity: DVD “Your Transformation” – basic level and DVD “Improving condition” – intermediate level. Exercises presented on the DVDs have been developed in cooperation with a physiotherapist, so they will not pose too much burden to the body and who knows, maybe just like me – you will fall in love with physical activity? I hope that thanks to this dose of knowledge, you will start your Transformation and you will enjoy every lost kilogram.